If a claimant commences proceedings, but the opposing party successfully strikes out its statement of case, what threshold must the claimant fulfil if it wishes to commence a 2nd, identical cause of action? This question was recently clarified by Lord Justice David Richards at the Court of Appeal, in the case of Harbour Castle Ltd v David Wilson Homes Ltd  EWCA Civ 505. Here, the original proceedings constituted an ‘abuse of process’ and the defendant submitted that, on the basis that the present proceedings ‘sought to revive a claim that had already been advanced ...’ these also constituted an ‘abuse’, warranting strike out. 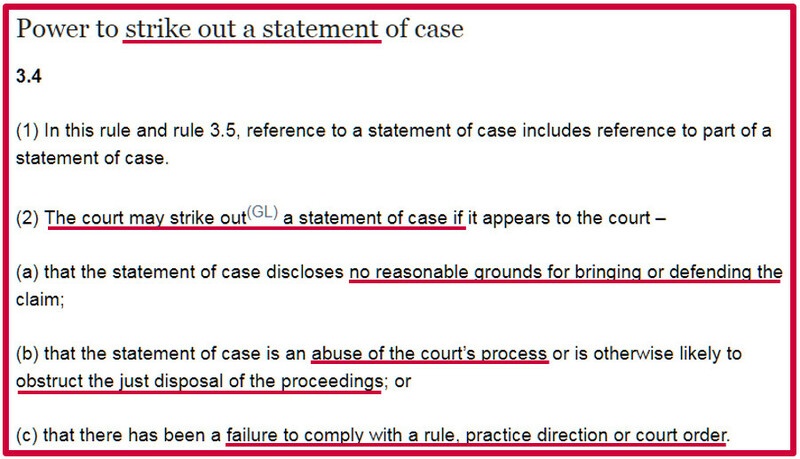 ‘Where, as in the present case, the question is whether to strike out a second set of proceedings raising the same issues as in the first, the authorities establish that a proper basis for finding the second action to be an abuse will be shown if (but this is not intended to be an exhaustive list) the first action was struck out for a deliberate failure to comply with a peremptory order or for inordinate and inexcusable delay in its prosecution or for a wholesale disregard of the rules’. Full text judgment can be accessed here. Failure to comply with an unless order in the course of the 1st action was ‘deliberate’. Delay to the 1st action was ‘inordinate’ and ‘inexcusable’. Breach of the civil procedure rules, practice directions and court orders constituted a ‘wholesale disregard’. Click here to access our Guide to Procedural Strike Outs.